They look beautiful and delicious! I am sure that Lady Cora and the Dowager Countess would enjoy them as well! Here I am at the end of the day, hungry looking at those sausage pinwheels. Yummmmm! As always you make everything look like just the thing you want to stick in your mouth....and not stop! Judy, wouldn't we love having tea with those two! Wonder if the Dowager Countess would give my tea table that look of hers - you know the one that looks like she's smelling something really vile! Very cool idea to make your own sausage for these. I love puff pastry for its ease of use.. and flavor! These are so cute! These pinwheels look so beautiful! I usually see these as desserts, which is what I thought when I first saw this photo on Food Gawker. Pinwheels with sausage? Savory is even better! Smidgen, thanks! Now that I've tried it, I may never buy ready-made sausage again. Thank you, Julia. I agree - savory is even better! Aren't these usually made with cinnamon? Replacing it with sausage is absolutely delicious! All your recipes are so so scrumptious. Hamilton, thank you so much! Cinnamon is good too, but I needed another savory for my teatable the day I came up with these. High marks for visuals. High marks for home-made sausage. High marks for cheese. But since I treat most bread as a surrogate delivery system – aka plate, platter, utensil – this is the kind of thing I would eat off the pastry rather than with the pastry. I am, however, most intrigued by your sausage making. Definitely no eyeballs, lips and ears in your choice of cut. How much fat and how much lean? What kind of grinder do you use? And, of course, the all-important spices – do you use Sage? Maybe you could do an article on this!?! Jean, this is going to sound somewhat air headed, but how exactly do I follow your blog? Like, I don't really know what google friend connect is? Do you have a follow button? Thank you, Sully! And I will do a post about homemade sausage one day. Good suggestion! If you come for dinner, I won't make you eat sausage pinwheels, pastry and all, but will happily make you your very own sausage patties. Hamilton, not airheaded at all. Good question. Do these two things: 1. Under "Followers" in side bar, click on "Join this site." And 2. Below that, under "Follow me by email," enter your email address and hit "submit." Do those two things, then report back to me how it went! Elegant and simple. Inspires me to have a cocktail party. Thanks, Greg! I make all too many foods that take a lot of time - am only too happy to have a few favorites that come together quickly. Thanks, Mary. I think it's especially enjoyable when the weather starts getting cooler. What kind of sausage do I like? I have never cared much for Italian sausage. My husband likes bratwurst and I prefer Portuguese sausage (linguicia.) But since these have only a small amount of sausage, I might like them. They look like something that would be fun (and easy) to make so I think I'll give them a try. Ruth, they really are easy. And even my husband, who is not a sausage fan nor even a person who likes hors d'oeuvre type things, loved these and wants to have them again soon. These look delightful---love the idea of homemade sausage. a fav of mine along with spinach/cheese filling too!! Malli, thanks! And, ooh, spinach would be good too. And very pretty. Oooh.. I love making pinwheels like this. And the possibilities of fillings are endless! These look absolutely amazing, Jean!! Thanks, Jenn! Everything just looks more festive in a pinwheel! These look to pretty. I love how easy they sound too. Thanks for sharing your recipe. I found your blog from your link on Food On Friday's on Carole's Chatter. Nice to meet you. Your blog is great!!! Thanks so much, Renee! I hope you'll try them soon. This one's definitely going on Pinterest! Thanks so much, Abby! And let me know how these pinwheels turn out for you. What a wonderful idea. I think I will try with a locally made sausage that has sage and rosemary in it. Love your blog! Kay, thank you! 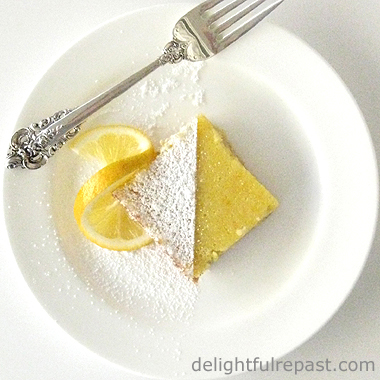 It's one of those things that is so easy but always immpresses guests! This is a recipe I MUST try. Last week I made something called Sausage cheese puffs which is similar but these look great too. We love sausage at our house and in the past even created our own. Check out my blog for my recipe a week ago. Thanks, Beth! I like to make my own sausage so that it's seasoned exactly to my liking. Also check out my Sausage Rolls. Those turned out wonderful and what a great savory for Afternoon Tea! Thanks, Bernideen! Means a lot coming from you. Would love to have tea at your beautifully set tea table! Oh, these look good. 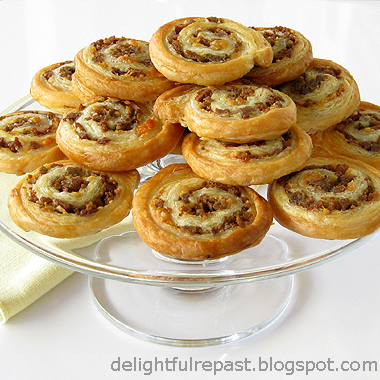 My hubby would love them and what a wonderful savory for afternoon tea. Thanks for sharing the recipe. Sandi, thank you! I hope you'll make a batch for him soon and let me know how they came out. Thank you, Maristella. Guests always love them! Those look delicious Jean! I would love them with a bowl of soup! Merry Christmas and thanks for faithfully participating in my blog party. My pleasure, Bernideen! And what a great idea - I've never thought of having these with soup, but YEAH!